Can I brew tea pods and coffee pods in the same brew basket? For best results and optimal flavor, we recommend using a separate brew basket for tea pods. If you must use the same basket for both coffee and tea, it should be cleaned thoroughly between uses. Offer your guests a cup of the finest mountain-grown green tea with the convenience of a single-use tea pod! 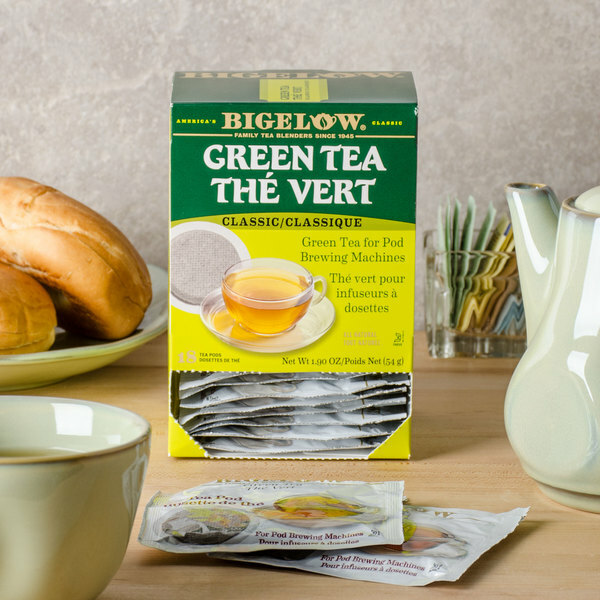 The Bigelow Tea green tea pods are perfect for fast beverage service, or self-service stations in your coffee shop, hotel, or cafe. This smooth, all-natural green tea comes from the leaves of the Camellia sinensis plant and undergoes a special handling process, leaving the green tea blend more delicate and lower in caffeine than black tea. Green tea is full of antioxidants that are a great part of any healthy lifestyle. When brewed, it has a light color with a subtle green hue, refreshing flavor, and a subtle, earthy aroma. 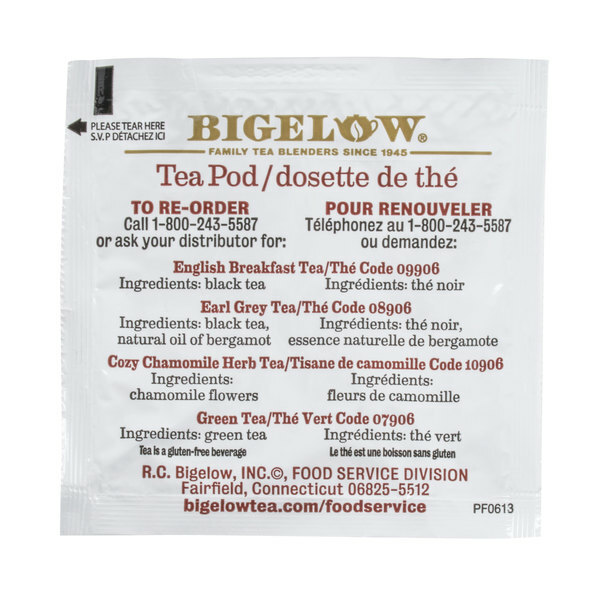 A family-owned business since 1945, and now a leader in the specialty tea industry, Bigelow prepares each tea blend with utmost care and attention to ensure the best possible tasting tea. 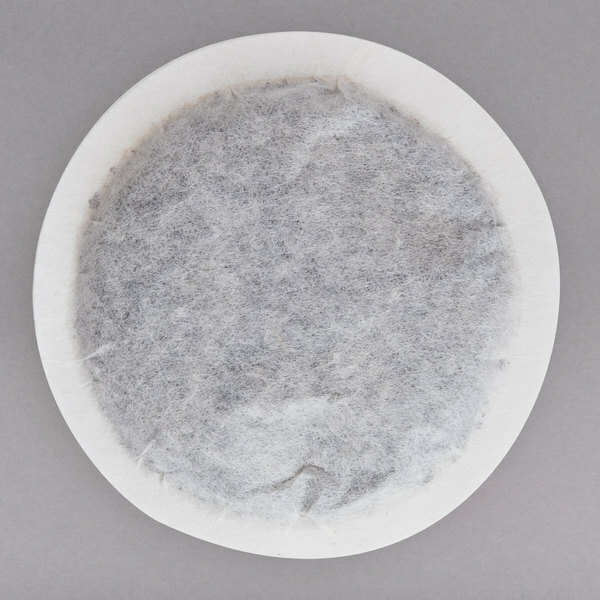 As opposed to bulk tea, these tea pods cut down preparation time and are suitable for use with pod brewers, or as a single-service tea bag. Each pod makes one 8 oz. cup of tea. 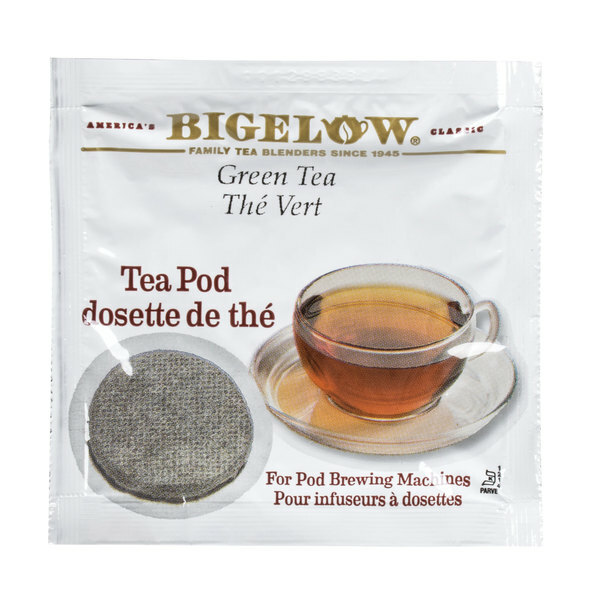 A nice green tea brewing pod from Bigelow. The tea is awesome and really has a nice soothing flavor. A great tea to drink and enjoy all throughout the day. The Bigelow green tea pods are perfect for mini pod brewer. 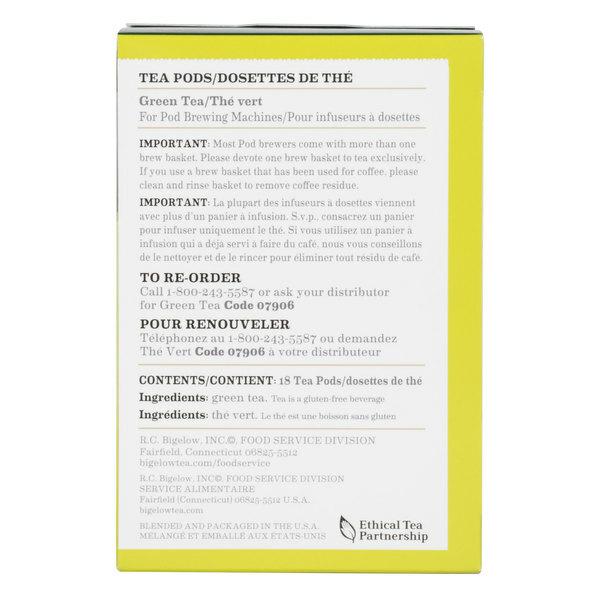 The tea tastes great and the pods are a very convenient way to make a single cup of tea. 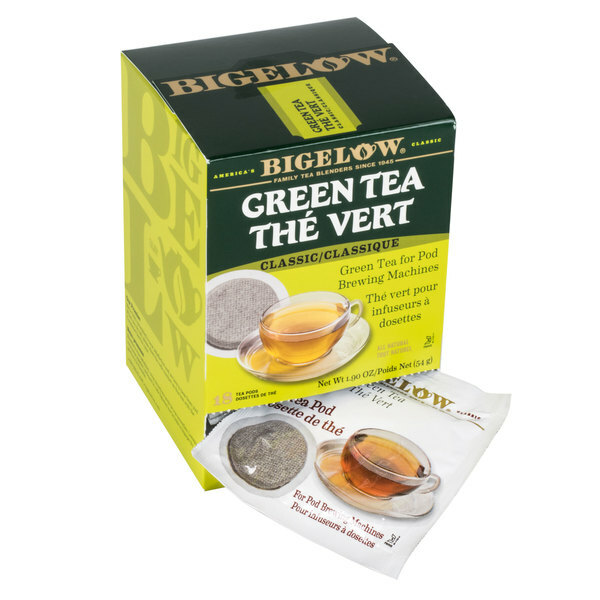 The Bigelow Green Tea Pods steeps well and tastes great hot or cold. It is great for weight loss. I would highly recommend this for all Tea lovers. I am a green tea fanatic and love these easy to use tea pods. I just pop them in my brewing machine and within minutes I have a nice brewed cup of green tea. It is delicious. Love the green tea pods that are perfect for brewing machine. The pods are so convenient and take the guess work out of measuring. The tea is perfect every time. 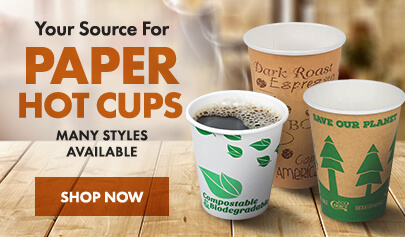 These are great tea pods for brewing machine! This green tea is just fabulous! Great price, great quality and convenience packaging. I would recommend to anyone! Great fresh taste and easy to use. Nice to have a pod healthy option of green tea with it's immune boosting properties! Works great and the packets are foil and plastic so it stays fresh- each individually wrapped! 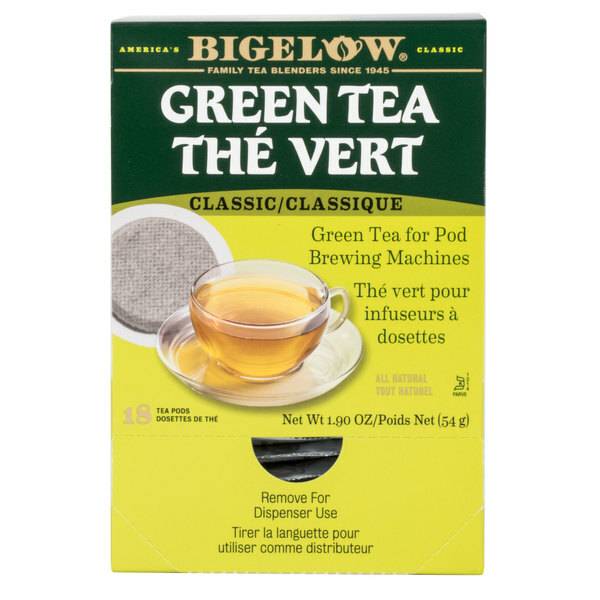 The green tea pods by Bigelow is easy to use with the pod coffee machine but I have also let it steep in a cup of hot water. It is moderately light in a Amber color and flavor. These tea bags are stuffed with tea and do very well either in a brewing machine that takes pods or steeping the cup. Will buy more.